Scripts can invoke an action when a script page appears on the agent’s display. Note: If you want to update contact data when a script runs, then use the script’s Outbound contact data load action instead of using the Update Contact Data action on page load. 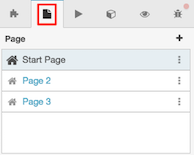 Setting the page load action to Update Contact Data can result in the data loading incorrectly. Click the script’s name to open it in the editor. 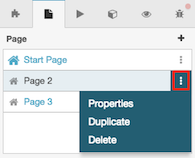 In the pages list, open the menu for the page you want to assign an action to. Page-specific properties are listed. Click the button below Page Load Action.